With the 2018 elections less than a month away, support for cannabis legalization continues to climb. More than six in ten Americans now think cannabis use should be made legal, according to a new Pew Research Center survey. The increase continues three decades of steadily growing support among nearly all demographic groups—and represents double the support Pew found in 2000. Even groups who remain opposed to legalization, such as Republicans and older Americans, have become far more favorable to the idea in the past several years. All told, 62% of Americans favor legalization, Pew found. 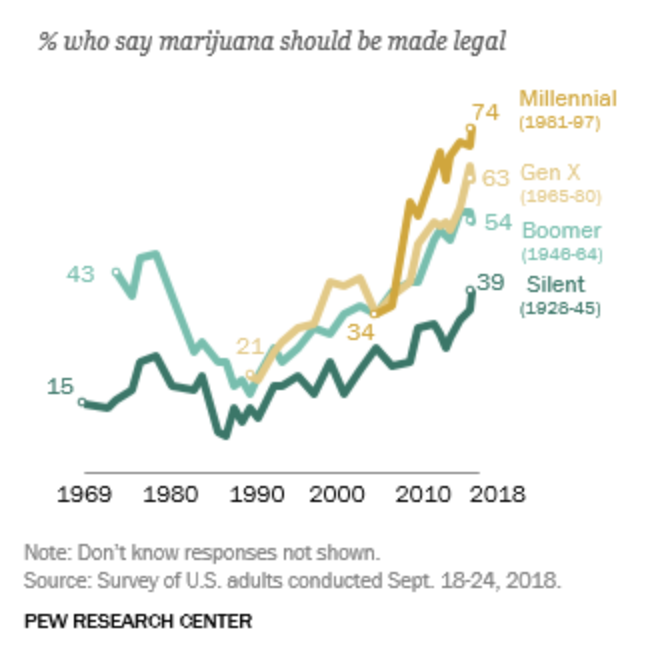 Younger generations were more supportive, with majorities of millennials (74%), Generation Xers (63%), and baby boomers (54%) on the side of legalization. Among the Silent Generation, or those born between 1928 and 1945, 39% said they support legalization. That’s lower than other generations, but it’s a significant increase from a year earlier and nearly double what it was in 2000. Other demographic groups with majorities opposed to legalization include white evangelical protestants (52% opposed) and Republicans (51%). Among respondents who identified as Hispanic, 50% said they oppose legalization while 48% said they support it. Nearly every other demographic group surveyed, however—including men, women, blacks, whites, Catholics, mainline Protestants, the religiously unaffiliated, and people of all levels of education—showed strong support for legalization. The overall 62% support is only slightly higher than the 61% support Pew found a year ago, in October 2017. The percentage of Americans opposed to legalization changed more significantly, falling from 37% to 34%. Voters in four US states will consider legalizing some form of cannabis in November’s elections. Michigan and North Dakota are set to vote on adult-use legalization, while Utah and Missouri will vote on legalization for medical use. The Pew survey polled 1,754 adults across all 50 states between Sept. 18 and Sept. 24, 2018.